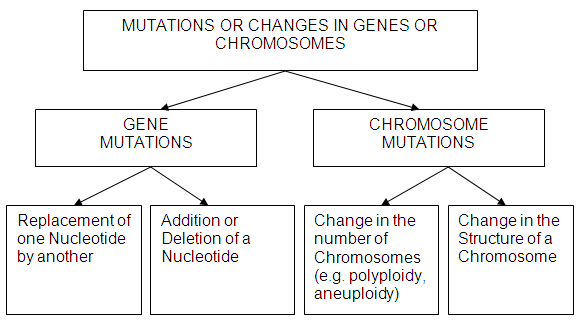 Mutations are changes in genes or chromosomes. Mutations may be spontaneous (i.e. arise naturally as random errors in DNA) or induced (i.e. deliberately or accidentally produced by chemicals or radiation). Mutagens are chemicals or forms of radiation that cause mutations. Addition or deletion of a nucleotide will probably cause a non-functional protein. Polyploidy - is a condition of having extra sets of chromosomes to make organisms such as plants tetraploid (4n). This is an advantage in plants as cells are larger. Aneuploidy - is a condition of the gain or loss of individual chromosomes. Examples include Downs' Syndrome (extra No. 21 chromosome), Turner Syndrome (extra X chromosome in a female), and Klinefelter Syndrome (extra X chromosome in a male).